The recipe requires a very expensive cut of meat. However a special occasion can help you create an elegant dish in little time. Cut 4 medallions at the thinnest part of the fillet (filet mignon) around two fingers high. This way you have steaks no more than 150 grams each. 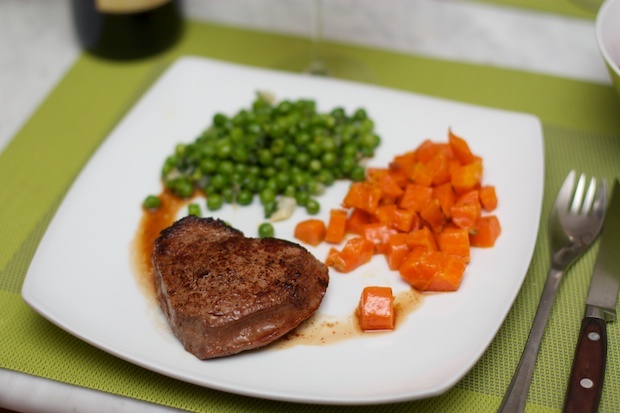 To provide nice colors on the plate, I made carrots and peas along with the filets. The carrots are boiled and sauteed in a little butter. The peas cooked with onion and olive oil. Of course, the dish can be accompanied by any side dish of your liking: buttered potatoes, green beans, spinach or other greens will do just fine. It’s important, however, that you do not serve the fillet minion alone because it would make the dish a bit sad and you would not appreciate the goodness of the meat. Pour the cognac in a saucepan. In a skillet, melt the butter and bring to light brown. Lay the slices of fillet minion and cook three minutes on each side. While the meat is browning, warm the cognac. After six minutes of browning, pour in the cognac and ignite the liquid with a. Cover the pan. Experts use the flame of the stove, but if you are a novice, use a match. When the flame goes out, season with salt and pepper. Bring to the table immediately surrounded by vegetables.